Clifford the Big Red Dog is one of those properties that never really gets old. It's a certifiable classic. Now the big guy's poised to make a comeback courtesy of the Douglas Company. The toy maker has some very cool looking bags and totes on the way featuring the character. Zebra and leopard prints are the order of the day for the line as the collection features lots of animal print, patent leather, and (of course) enough rhinestones to see you from space. 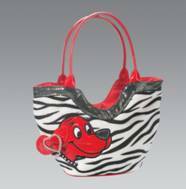 Big Red Dog fans should look for the full line to be available at retail this September.